When a costumed criminal calling himself The Trickster bombs a playground with exploding packages on parachutes, Barry and Joe seek the advice of the original Trickster, James Jesse, who is currently imprisoned in Iron Heights. At first Jesse seems all too happy to help the police catch this upstart impersonator... but can be trusted? Or is The Trickster plotting his greatest trick yet? And can Barry truly trust Harrison Wells to help him? Silence of The Lambs (James Jesse is kept in a special cell like Hannibal Lecter and is consulted in order to catch another criminal) Speed (referenced when The Flash is fitted with a bomb that will go off if he runs under a certain speed), Star Wars (James Jesse's "I am your father" speech to Axel Walker as well as Wells' speech to convince Barry to give himself over to a mysterious force he barely understands), The Flash comics of Geoff Johns and the 1990's The Flash TV series. James Jesse identifies the poison he used on the guests at Mayor Bellows fundraiser as trimethylmercury 32. But when we hear him speaking to the crowd through Iris' phone later on, he calls the poison trimetyhline 32. Mark Hamill, unsurprisingly, steals the show as James Jesse. Despite not getting as many great lines as Hamill, Devon Graye holds his own alongside Hamill in their scenes together and manages to go over the top in the right ways as Axel Walker. It's a brief moment, but Joe West's pep-talk to Barry is one of Jesse L. Martin's finest moments yet on the show. And considering how many great moments he's had, that's saying something. The slow motion sequence in which we get to see the fight between The Flash and The Reverse Flash in the Allen home is very well executed. The first Trickster was originally a circus acrobat named Giovanni Giuseppe. Afraid of heights as a boy, he crafted his first trick as a teenager - a pair of "air-walking" shoes that allowed him to levitate with a click of his heels. Giovanni built a number of other ingenious devices and used them in his act until he became inspired to become a costumed criminal after learning about The Flash. Adopting the alias of James Jesse, the Trickster was an oddity even by the standards of The Rogues Gallery. He didn't care about money - he just liked the idea of outsmarting The Flash and making him look silly. The Trickster would later reform at the behest of the superhero Blue Devil, who pointed out that Jesse's tricks could make him a fortune as a special effects artist. The two became friends and supported one another's careers in Hollywood afterward. James Jesse has the notable distinction of being one of the people people in the DC Universe who can honestly be said to have single-handedly saved The Earth. This occurred during the Underworld Unleashed storyline, where Jesse was able - with an assist from Captain Marvel - to pull a con on The Demon Neron. Unfortunately, nobody - save Neron and possibly Captain Marvel - has any memory of the incident. This incident inspired Jesse to become a con-artist for the forces of good and for him to start collecting the gadgets and weapons of imprisoned super-villains to prevent them from falling into the wrong hands and led to Jesse becoming a special agent for the FBI. It was one of these caches of gear that was found by Axel Walker, who crafted a new costume and began committing crimes in Keystone and Central City as the new Trickster. Axel was more blood-thirsty than James Jesse and quickly became a person of interest to both The Flash and James Jesse. Despite this, Captain Cold still took Axel on as a potential recruit for The Rogues Gallery and - to his credit - was able to keep Axel relatively under control. 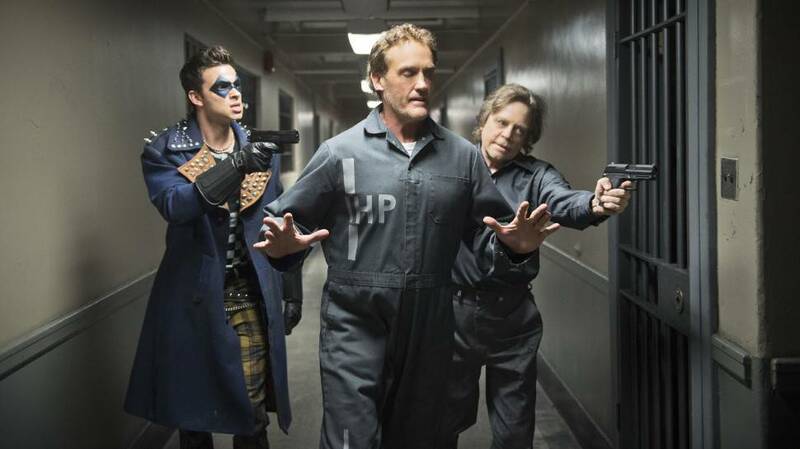 Mark Hamill played the James Jesse version of The Trickster on the 1990s Flash show, though the character was quite different from James Jesse in the comics. This Trickster was much closer in personality to The Joker, being more violent than the original Trickster. Mark Hamill also played The Trickster in one episode of Justice League Unlimited. There, The Trickster was portrayed as a mentally unbalanced but good-natured man who only put on his costume and caused trouble because of an unspecified mental condition that required medication. He was quite happy to turn himself in after The Flash politely pointed out he was wearing his costume again. Ironically, Mark Hamill would find success playing The Joker on Batman: The Animated Series not too long after The Flash was canceled. Indeed, the voice Hamill used as The Trickster is not too far from his voice for The Joker. Hamill uses a similar tone of voice in this episode. Oddly, the 1990's The Flash show foreshadowed the creation of Harley Quinn, who first appeared on Batman: The Animated Series. The Trickster had a similar female sidekick called Prank, who - in one incarnation - was a disturbed Trickster fangirl whom he alternated between barely tolerating and outright abusing. The other incarnation of Prank was a doctor with whom James Jesse became obsessed, whom he abducted and forced into the Prank costume. This episode mixes various aspects of the many versions of The Trickster across different media. This version of James Jesse draws heavily off the version created for the 1990s Flash TV series in terms of personality. The explanation for how Axel Walker got a hold of The Trickster's equipment is taken directly from the comics. And Jesse's attitude regarding someone taking his name and gear is pretty much the response James Jesse had regarding Axel Walker in the comics, though he was more intent on schooling the upstart and taking his gear back than killing him. James Jesse and Axel Walker never worked together in the comics. James Jesse did have an illegitimate son in the comics, but it wasn't Axel Walker. The conceit that James Jesse is Axel Walker's father is also a nod to Mark Hamill's other most famous role as Luke Skywalker in the Star Wars films - albeit with Hamill now playing the role of the father turning his son to a path of evil. Devon Graye's costume as the new Trickster is fairly close to the design for Axel Walker's Trickster suit in the comics. Production photos from the 1990's Flash TV show are used to show off James Jesse's past crimes. In the flashbacks, we learn that The Reverse Flash somehow lost his connection to The Speed Force during the battle with Barry Allen. In the comics, some speedsters manifested a power to manipulate the relative speed of other bodies in motion, either slowing them down or using their velocity to fuel their own speed. Some even possessed the ability to drain the speed powers from other speedsters. It's possible that Barry Allen did this by accident, in this case, to depower The Reverse Flash. Mark Hamill wears a long-haired wig in his scenes in prison that resemble his haircut when he played Luke Skywalker. Joe comments that it looks like nobody has been in The Trickster's hideout since the 90s. This was, of course, when Mark Hamill played The Trickster on the 1990s Flash TV series. Mark Hamill's Trickster spandex suit from the 1990's Flash TV show can be seen on a mannequin in the background when Barry and Joe investigate The Trickster's hideout. However, the costume also seems to have a blue cape that resembles the one worn by The Trickster in the original Flash comics. The door to The Trickster's armory is decorated with a stylized likeness of The Trickster's face that bares more than a passing resemblance to Bruce Timm's design for The Joker - another nod to Hamill's voicing The Joker in various Batman cartoons and video games. In another reference to the number 52 (a number of some significance in DC Comics lore), The Trickster says he planted a bomb between 52nd Street and Avenue B. Actor Vito D’Ambrosio played a police officer named Tony Bellows in the 1990s Flash TV series. He appears in this episode playing Central City Mayor Anthony Bellows. Strapping a speed-sensitive bomb to The Flash is a time-honored gimmick from the classic comics. Vibrating his molecules to pass through solid objects - or phase - is another classic Flash trick. Dr. Henry Allen notes, as he looks around STAR Labs, that "half of this stuff didn't even exist when I was practicing." Dr. Allen is, of course, portrayed by John Wesley Shipp, who played Barry Allen in the 1990s The Flash show and also worked out of STAR Labs in the B.I. (Before Internet) age. Presumably, the technology Eobard Thawne uses to become Harrison Wells was originally intended to be used on a young Barry Allen. In the original The Flash comics, Eobard Thawne's ultimate goal was to replace Barry Allen in some form or fashion. The explosives used by Axel Walker have the exact chemical compositon as the bombs used by James Jesse 20 years earlier. It is later revealed this is because Axel Walker was utilizing the armory in James Jesse's hideout. Axel Walker uses a "Felicity-level" scrambler to hide the origin of his video blog uploads. James Jesse poisons the crowd at the Mayor's event with champagne laced with trimethylmercury 32. It is described as relatively fast-acting poison and we see one person die one hour after drinking it, foaming at the mouth and suddenly dropping dead. Trimethylmercury 32 is not a real substance. Presumably it is an even more lethal form of dimethylmercury, which is one of the most lethal mercury-based compounds known to man. Dimethylmercury is so toxic that it is hazardous if present in sufficient quantities as to be detected by odor. Dimethylmercury is particularly noteworthy in that it can pass through latex, PVC and butyl within seconds, making it unsafe to handle in all but the strongest of protective gear. It is not fast acting, with the symptoms sometimes taking months to show. Barry is revealed to be able to phase - or move through solid objects - by vibrating his molocules at the natural frequency of air. Trickster: Tricked ya! (laughs) Look who's back! My tricks. My treat. But I'll give you something good to eat! Today's special? A city in ashes. The Trickster proudly welcomes you all to the new disorder! Cisco: Talking in the third person. That's never a good sign. James Jesse: You know, when I was free and at my height, a day without casualties was like - well, like The Cubs winning the pennant. It just never happened! James Jesse: I ask only one thing. When you find this shtick stealer, gimmick grabber, this pathetic wannabe FAKE... make sure your safety's off. Axel Walker: So what's next? In your last letter you said you had something big in mind for when you got out. James Jesse: I've had 20 years to come up with the perfect trick. It's going to be my masterpiece. My Mona Lisa. My Breaking Bad Season 5. James Jesse: They gave me cable in prison so I'd stop killing the guards. Axel Walker: (nodding as if that explains everything) Right. Axel Walker: There's just one thing I've been dying to ask. Why did you choose me? James Jesse: Because... I knew you had the strength to fulfill my legacy. Besides... it was in your blood. Axel Walker: What do you mean in - in my blood? Jame Jesse: The real reason I tracked you down and groomed you to be the best you could possibly be, Axel? I am your father. Joe: Look, whatever else he is, he's Harrison Wells. You love science! He is science! It's like you made best friends with Einstein! Barry: You're saying I wanted to be tricked? Joe: You always want to be the person who sees the best in people. I've been a cop for 25 years. All I can see are the flaws. The lies. The dark thoughts that people think I don't see... I wish I could be you. As fast as you are, that is your real power. Don't let Wells take that from you. I don't know why he's helping us. All that matters is that he is. Dr. Wells: Listen to me, Barry. Breathe. Breathe. Feel the air. Feel that wind on your face. Feel the ground, your feet... lifting you up, pushing you forward and the lightning... Barry... Feel the lighting! Feel its power. Its electricity. Pumping trough your veins,.crackling through you, traveling to every nerve in your body... like a shock! You're no longer you now. You're part of something greater. Part of the Speed Force. It's yours. James Jesse killed 10 civilians and 2 cops during his reign of terror as The Trickster 20 years earlier. James Jesse has his own special wing in Iron Heights prison. He was put in it five years earlier after he talked his psychiatrist into committing suicide. James Jesse shows a fondness for red licorice twists and anyone who meets with him is given a package of the candy to keep him cooperative. Harrison Wellls' original name for his independent science lab was Technological Engineering Scientific Studies or T.E.S.S. - in honor of the love of his life, Tess Morgan. She suggests Scientific and Technological Advanced Research Labratories or S.T.A.R. Labs, because she sees Harrison Wells as the only star in her sky. Iris West still has a key to the coffee shop she used to work at, despite being a full-time reporter. Barry phases through solid matter for the first time. Barry officially unmasks himself before his father, Dr. Henry Allen. At the episode's end, Barry reveals his secret identity to Eddie Thawne. Eddie lies to keep Iris from investigating Mason Bridge's death, though he is unhappy about it and says that he and Joe will have a long conversation about this after the three of them figure out what Wells is up to. The flashbacks for this episode reveal a fair amount of information regarding Eobard Thawne - the biggest revelation being that the Reverse Flash who fought Barry Allen on the night of Nora Allen's death did not resemble Harrison Wells. Before The Flash and Reverse Flash showed up, the wine in Nora Allen's glass was defying gravity, much like the liquid in the containers in Barry's lab just before he was struck by lightning. An adult Barry Alllen was responsible for carrying his past self to safety during the battle with The Reverse Flash. This is how a ten year old Barry Allen wound up in the middle of the street some distance away from his home. This Reverse Flash somehow lost his connection to The Speed Force during the battle with Barry Allen and became stuck in the past. Eobard Thawne tracks down Harrison Wells and causes a traffic accident that kills Tess Morgan. Thawne uses some kind of futuristic technology to kill Wells and take on his appearance. This device apparently works on a molecular level, actually changing Thawne into Wells physically. This would explain why the second blood sample found by Joe and Cisco 15 years later did not match that of Harrison Wells! Eobard Thawne's actions change the timeline in one major respect. He says that originally Harrison Wells and Tess Morgan activated their particle accelerator in 2020. He is unwilling to wait that long, kills Morgan and replaces Wells, stepping up the time-table to get the accelerator activated in 2014. Caitlin doesn't get much to do in this episode except offer hugs. But that's better than Iris, who only gets to ask male characters to investigate Mason Bridge's disappearance for her before being taken hostage. A brilliant episode that manages the neat trick of being self-referential and self-aware without being too annoying about how utterly goofy and silly it is. Hopefully we'll be seeing more of The Tricksters later on.